One of the holy Trinity, Shiva is a living God. The most sacred and the most ancient book of India, the 'Rig Veda" evokes his presence in its hymns. Vedic myths, rituals and even astronomy testify to his existence from the dawn of time. But Shiva, Destroyer, the mendicant, is indefinable. 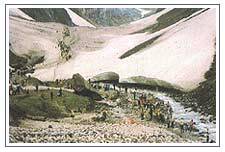 The Yatra (pilgrimage) on foot to Amarnath Cave, considered one of the holiest naturally occurring shrines of the Hindu faith, has continued annually for little more than a hundred years. Extending up 130 feet, the Amarnath Cave is high and shallow. Inside the large opening, behind an open-gated iron fence, an underground trickle of water emerges 10 feet up from a small cleft in the sedimentary rock and freezes s it drips to form a small cleft in the sedimentary rock and freezes as it drips to form a tall, smooth cone of ice. According to the legend, Shiva made the Gods immortal by providing them with the celestial nectar, and resided here upon their request. This boon of immortality lent the name Amarnath. Kashmir was a great Shaivite center in the 1st millennium CE. Kashmiri Shaivism is referred to as "Trika Mata" and it dates back to the 8th century CE. The three components of Kashmiri Shaiva literature are "Agama Shastra", "Spanda Shastra" and the "Pratyabhijna Shastra". "Kalhana", a contemporary of King Jayasimha of Kashmir of the 12th century describes Kashmir as Parvati incarnate. Legend has it that there was once a lake by name Sati-Saras named after Shiva's consort Sati. Sage Kashyapa, the grandson of Bhrama, destroyed the demons residing over here. It is believed that Kashyapa then converted this lake into "Kashmira Mandala". Legend has it that Lord Shiva recounted to Goddess Parvati the secret of creation in a cave in Amarnath. Unknown to them a pair of mating doves eavesdropped on this conversation and having learned the secret, are reborn again and again, and have made the cave their eternal abode. Many pilgrims report seeing the doves pair when they trek the arduous route to pay obeisance before the ice-lingam. According to an ancient tale, there was once a Muslim Shepherd named Buta Malik who was given a sack of coal by a Sadhu (saint). Upon reaching home he discovered that the sack, in fact, contained Gold. Overjoyed and overcome, Buta Malik rushed back to look for Sadhu and thank him. But on the spot of their meeting discovered a cave, and eventually this became a place of pilgrimage for all believers. To date, a percentage of the donations made by pilgrims are given to the descendents of Malik, and the remaining to trust which manages the shrine. 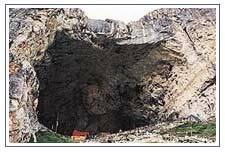 Yet, another legend has it that when Kashyap Rishi drained the Kashmir valley of water the cave and lingam were discovered by Bregeish Rishi who was travelling the Himalayas. When people heard of lingam Amarnath for them it became Shiva's abode and a centre of pilgrimage. From Baltal there is a regular bus service during the pilgrimage period, getting back to Srinagar that night. At other times, camp at Baltal and continue to Sonamarg at a more leisurely pace the following morning. From Sonamarg there are three buses a day to Srinagar and the drive takes around five hours. Please ensure that you are physically and mentally fit to perform the journey as the Yatra involves trekking at an altitude of 1,4000ft. Get yourself medically examined and certified fit for the journey and forward the certificate to the registering authority designated for your area of residence. Do carry sufficient heavy wollens including sweaters, woollen thermal body warmers, trousers, monkey caps, mufflers and any other cold fighting apparels. Other items needed to be carried are wind cheaters, raincoats, sleeping bags, blankets, water proof shoes with sufficient grips, small water proof tents, torch with sufficient batteries and walking sticks. Ladies are advised to avoid sarees. Instead body hugging clothing like Salwar Kamiz, pants, etc are advised. Carry dry eatable stocks with you viz. biscuits, Sugar, Candies, chocolates, milk powder, assorted dry fruits, pickles, honey, lemons and tinned foods and other items suiting your palates. Water bottle, spoons, tumblers, saucers and plates may also be carried. Ration and firewood quota is also made available en route and can be purchased. Registered ponywalla, porter, dandyman may only be hired. They are available for prefixed tarrifs. Ponies carrying luggage and eatables should remain with you all the time. At no point of time should you get out of touch with them. This is to avoid inconvenience. Move slowly and steadily, as this is an arduous pilgrimage and maintain discipline. Instructions of Yatra officer should be adhered to. Various officials are deployed by the Government of India for your help. Carry sufficient money to pay for your accommodation at Pahalgam and meeting your other requirements. All medical facilities during Yatra are free. It is advisable to carry your own personal medical kit and First aid box. Don't overstarin on steep gradients. Don't relax at places where warning signs are fixed. Do not pay more to any of the hired services for which the prices are fixed. Yatries without registration card, Aged, infirm, ailing and ill clad persons will not be allowed to proceed beyond Pahalgam and Baltal. WARNING: At the present time this is a very dangerous area and it is highly advised that foreign tourists do not go here because of Kashmiri militants. It is best to check the situation in advance.